Disclaimer: The following Containment Procedures are expected to change, due to revisions in Containment Protocols X10-06, which specifically deals with reality bending anomalies. Refer to: Collins, Jessica, "The Scranton Report", Entropy: An SCP Foundation Journal, 19██. Special Containment Procedures: SCP-1095 is provisionally contained on-site at ██████, Texas. The surrounding building is closed off to the public under the cover that it is under renovation. At least two Security Guards are to surround the area to prevent trespassing. Due to the nature of SCP-1095, level 1 security personnel are also posted near the entrance of SCP-1095. A barrier has been constructed around the side of SCP-1095 that is within SCP-1095-1. Site-156 is established within SCP-1095-1 in order to minimize the chance of an Xi-06 Event. The area is under surveillance to monitor the activities of all SCP-1095-2 instances. Agents and Security Guards are posted by SCP-1095-1's police precinct and courthouse. Personnel are encouraged to assist SCP-1095-2-B instances in intervention of possible Xi-06 events. Mobile Task Force Xi-06 ("Bixby Hunters") is responsible for handling Xi-06 Events. After a Xi-06 event, witnesses of the event are to be administered Class-B amnestics. Personnel from Site-156 are responsible for determining the new location of SCP-1095. This is accomplished by translocating via SCP-1095 and surveying the new surrounding area. The new location is to be reported, and Containment Specialists will be sent to the area to ensure proper containment. Information related to SCP-1095-2-B-1 is to be reported to the Site Director of Site-156. 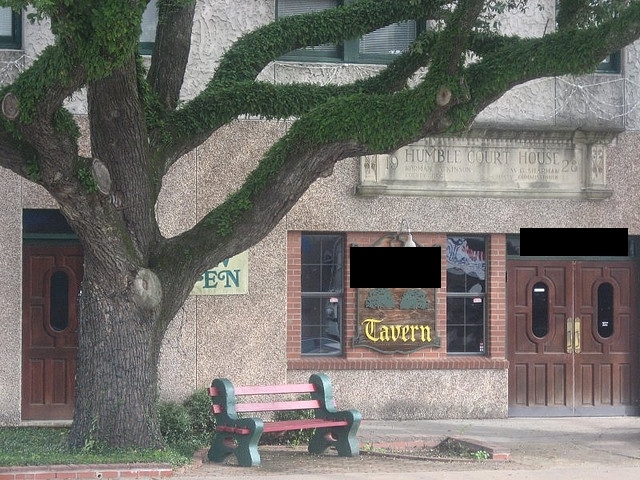 Description: SCP-1095 is a spatial anomaly measuring 3.1m x 3m x 2.4 m, inside the ███████ Tavern, located in ██████, Texas. SCP-1095 exhibits a minor effect on local reality, appearing as slight blurring around the surrounding area. A subject passing through SCP-1095 will be instantly translocated to a location resembling the town of ████████, ██. (referred to as SCP-1095-1). The location of SCP-1095 inside SCP-1095-1 is inside the town hall of SCP-1095-1. SCP-1095-1 covers an area of approximately 1.2km². Any area beyond SCP-1095-1 is perceived as a white plain, which is domed by an electrical field of unknown origin. SCP-1095-1 has approximately 70,000 humanoid residents, all of whom are Level 4 Reality Benders (referred to as SCP-1095-2). Instances are capable of manipulating local reality within a 11 meter radius. This manipulation is limited to movement of objects,1 transformation of objects, and spontaneous materialization/dematerialization of objects. Instances cannot directly affect other instances or personnel with these abilities. Most instances are also incapable of manipulating local reality upon themselves, with the exception of instances of SCP-1095-2-B. SCP-1095-2-A: Instances classified under this group make up the majority of residents (approximately 68,000). These instances use their abilities for trivial purposes (e.g: opening a door, moving a car, etc.). Attempts to use their abilities beyond this is halted by instances of SCP-1095-2-B. SCP-1095-2-B: Instances classified under this group make up approximately 300 residents. These instances resemble law enforcement, judicial members, and political leaders. In most cases, these instances are noted to use their abilities to enforce order. SCP-1095-2-C: Approximately 50-200 residents are classified under this group. Instances under this group use their abilities with malicious intent. In most cases, intervention of 2-B instances is sufficient enough to contain 2-C instances. In the result that intervention is not successful, these instances escape SCP-1095-1, in an attempt to pass through SCP-1095. 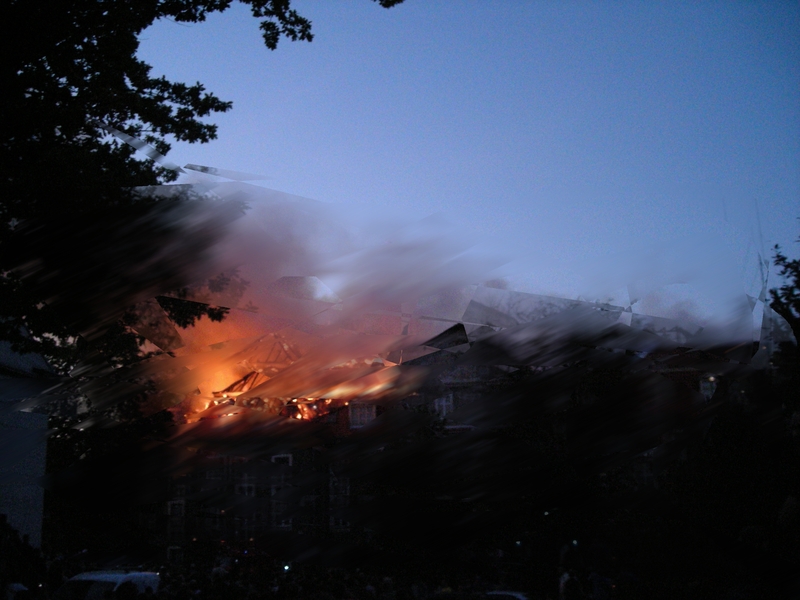 Any instance of SCP-1095-2 passing through SCP-1095 into universal local reality results in an Xi-06 Event.2 During an Xi-06 event, surrounding local reality is heavily disrupted.3 This disruption results in destruction of local reality outside of SCP-1095-1, surrounding SCP-1095.4 After an Xi-06 Event, SCP-1095 will instantly translocate to another location. The location SCP-1095 appears in will usually be inside a tavern or store in a small town. Discovery: SCP-1095 was originally found inside a tavern in ██████, Nevada. The anomaly was reported to a local police force. An Agent embedded within the force contacted the Foundation, and a provisional containment area was constructed soon after. Shortly after containment, several D-Class personnel were sent through SCP-1095 to determine its anomalous properties. After subsequent exploration, instances became aware of personnel and greeted subjects. Instances of SCP-1095-2-B engaged with hostility. The D-Class were instructed to leave SCP-1095-1, where an Xi-06 Event occurred shortly afterward. The Xi-06 Event resulted in breach of containment, destruction of the containment area, and numerous casualties. An MTF was dispatched to the area, ending the event by terminating instances of SCP-1095-2 outside of SCP-1095-1. Class-B amnestics were administered to witnesses of the event. After the event, SCP-1095 was missing from its original location. A test subject remained within SCP-1095-1 during the aftermath. The new location of SCP-1095 was found, and new containment procedures were devised. Diplomatic relations were established between Foundation personnel and instances of SCP-1095-2. 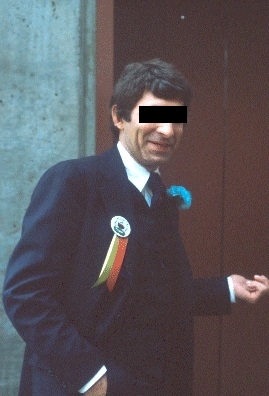 A minority of instances were deemed a threat and became classified as SCP-1095-2-C.
A photo of SCP-1095-2-B-1, who closely resembles former mayor ███████ █████. Foreword: SCP-1095-2-B-1 is the mayor of SCP-1095-1. SCP-1095-2-B-1: … Do not be alarmed. Yes, it is true that we have foreign men in our land. Yes, it is also true that we've had radicals attempt to escape after these men came. We must not look at this situation with pessimism, but with hope. Hope. It is what brings us together, and it is what will pull us through. The truth is that without these men, we would have never seen these traitors come out of the woodwork until it was too late. We would be living blissfully, walking past these treacherous individuals on a day to day basis. SCP-1095-2-B-1: But we must not fret. We have our friends to thank for arriving at the nick of time. Together, we will find these radicals and progress towards a brighter and happier future! Incident 1095-02: Site-156 was established within SCP-1095-1. Agents were embedded within the stores, markets, and other places of occupation. Increased surveillance lead to unrest among residents of SCP-1095. Legislature was passed by instances of SCP-1095-2-B. These laws relaxed surveillance by personnel. However, increased screening for SCP-1095-2-C instances were implemented. An instance of SCP-1095-2-A was accused of being an instance of SCP-1095-2-C.5 As a result, unrest escalated between residents. Security Guards were placed to calm the unrest in the streets of SCP-1095-1. Foreword: SCP-1095-2-B-12 is the sheriff of SCP-1095-1. The instance of SCP-1095-2-A was convicted and sentenced to two years in prison. Unrest continued to grow among residents. Although no causalities occurred, it was suspected that an Xi-06 Event would happen in response to the conviction. Security around SCP-1095 was heightened. Incident 1095-45: A press statement was released by SCP-1095-2-B-1. SCP-1095-2-B-1: … In recent months, we have been under great duress. Many joke that it's the 'radicals or the police', but I'd like to side with the latter. We have been faced with a hidden, unknown enemy that threatens not only to eradicate us, but also our friends. SCP-1095-2-B-1 nods towards Agent Thompson, assigned to Site-156. An agreement was made between the Foundation and instances of SCP-1095-2-B to reform the policy of screening for instances of SCP-1095-2-C. Surveillance decreased, and Security Guards/Agents were limited to posts by the police station and courthouse of SCP-1095-1. Several weeks after implementation of these procedures, several instances of SCP-1095-2-C breached containment, resulting in multiple Xi-06 Events. Several instances of SCP-1095-2-B passed through SCP-1095 in an attempt to aid personnel in containment. This resulted in extensive destruction of the town of █████, ██, where SCP-1095 was previously contained. Instances of SCP-1095-2-C were terminated. Instances of SCP-1095-2-B were instructed to go to back to SCP-1095-1. A cover story was established, under the guise that the town of █████ suffered a fire from a nearby forest. Broadcasts and news stories were intercepted to fit this story. Amnestics were administered to the residents of █████. The new location of SCP-1095 was found shortly after, and a provisional containment site was built around the area. SCP-1095-2-B-5, a close relative of SCP-1095-2-B-1 was missing after the incident. At the time of documentation, SCP-1095-2-B-5 has not been found. Addendum-1095-08: Approximately 5 months after Incident-1095-45, SCP-1095-2-B-5 was found near Site-132. SCP-1095-2-B-5 was placed under custody and sent to Site-██, which was closest to SCP-1095's provisional containment site. Foreward: SCP-1095-2-B-5 was noted to exhibit a noticeable effect on local reality, appearing as visual blurring within a 2 meter radius. This effect returned to normal whenever SCP-1095-2-B-5 left its radius. Dr. Kim: Can you tell me why you came here? SCP-1095-2-B-5: I can't tell you much. But what I can tell you is that I am here as a whistle-blower. I wish I had more time, but I am as good as dead. Dr. Kim: Don't worry. We will protect you. SCP-1095-2-B-5: No, you do not understand. We are duplicitous people. Our members carry enormous power. We are just excellent at concealing it. Even more-so than the residents we rule over. The only issue is that we could never overcome tens of thousands by power alone. Dr. Kim: Ok. To make this clear: you are stating that your members present more ability than they currently express. SCP-1095-2-B-5: That is correct. We were aware of methods where we can amplify these abilities if we concentrated on creating a hole in reality. We had a hole ready to be ripped open. All we needed was to have someone on the other side open it for us. It was a long wait, but the patience paid off. One of your people stumbled in with a camera strapped on his head, and we assumed we were ready to go. But then the rest of your Foundation showed up. That's when we had to establish negotiation. Dr. Kim: Noted. Anything else you would like to add? SCP-1095-2-B-5: The people you are hunting after … they are the wrong ones. I wish I can say more. Tell them to be careful. Tell your men to be careful. Because it was a mistake to come here. Dr. Kim: We will. Thank you for your cooperation. Conclusion: A few days after concluding the interview, SCP-1095-2-B-5's body heavily disrupted local reality within Site-██. This resulted in destruction of its containment cell. The instance expired. Local reality shifted to normal several hours after the event. Aftermath of the Xi-06 Event. Note the distortion surrounding the building. On 04/23/19██, an Xi-06 Event occurred within SCP-1095-1, despite no instances of SCP-1095-2-B translocating via SCP-1095. Several buildings were damaged, and 2 causalities were reported. Instances of SCP-1095-2-B arrested SCP-1095-2-A-18921, who was suspected to be the cause of the Xi-06 Event. Unrest grew between residents in SCP-1095-1. Shortly after arrest, an individual identical to the suspect was found among protesters. Both instances were arrested to determine which instance was responsible for the event. Extensive questioning did not distinguish the instances. A test was pending to take a DNA sample between both instances. Before approval, one of the instances was found deceased inside its cell; the other instance was missing. During this time, SCP-1095-2-B-1 was also noted to be missing. Civil unrest grew further, resulting in destruction and looting of SCP-1095-1. Additional Security personnel were assigned to calm the unrest. Deliberation among instances of SCP-1095-2-B and personnel deemed Johnathan Bickson, the Site-Director of Site-156, to be a temporary mayor for SCP-1095-1. The following is an excerpt of conversation between SCP-1095-2-B-1 and Agent Thompson, recorded shortly before the instance's disappearance. SCP-1095-2-B-1: …It's been quite a while since Cadwell has disappeared. How long would you say its been? Agent Thompson: About 6 months. SCP-1095-2-B-1: Oh. [pause] Has the Foundation spotted him? Thompson: I am not allowed to disclose that. You are also aware that he can't come back, no matter what we do. SCP-1095-2-B-1: [pause] Do you think the people like me, Thompson? Thompson: Of course they do. They're just in a frenzy because of the constant attacks from the radicals. SCP-1095-2-B-1: Ugh. I guess you have a point there. I can't help but feel that my decisions have been a bit shady, at best. I've made mistakes. Thompson: What do you mean? SCP-1095-2-B-1: It's a bit hard to describe. How can I put it? Uhh … well, it's like misdirection, except it's in- [cough] excuse me, throat's a bit dry. Except it feels intentional. I mean, it isn't, but I could have done better these past years. Thompson: I'm sure you don't have to worry. You've been a great mayor so far. SCP-1095-2-B-1: Right. [pause] You're right. 1. For the purposes of this document, "object" refers to any material or substance that an instance can touch. This includes but is not limited to inorganic materials (rocks and minerals, ferrous and non-ferrous metals, plastic) and organic materials (soil, flora, fauna). 2. Instances translocating from SCP-1095 via SCP-1095-1 are unable to return to SCP-1095-1. Instances that attempt to do so dematerialze upon touching SCP-1095. 4. An initial instance passing through SCP-1095 disrupts reality within a 20 meter radius. This exponentially increases for every 2 additional instances. 5. This was implemented under the Radical Act, Section 2C-142. Refer to: Bickson, Johnathan, “A Short History of SCP-1095-1's Legislature” N.p, 19██.